Barack Obama talked a lot about peace during his recent trip to Israel and Palestinian cities. Meanwhile, social networks in those countries are actually creating it, reaching into a million homes — and hearts — in the Middle East. 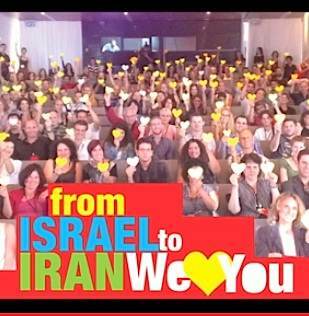 As the drums of war between Israel and Iran grew louder and more menacing last year, Israeli graphic designer Ronny Edry decided to make a poster of himself and his daughter with a bold message: “Iranians … we [heart] you.” He shared it on Facebook and, overnight, dozens of Israelis clamored to create their own posters with the same message of love. Then, Iranians responded in kind. One family in Iran gathered around the computer and cried. The simple act of communication between strangers in foreign lands soon inspired dozens of Facebook communities to pop up sharing similar pictures, all punctuated by hearts and flags. The first one, “Israel loves Iran,” led to “Iran loves Israel,” and “Palestine loves Israel,” and spread to every other country in the Middle East, and even to Europe, and Asia. The humble graphic designer, Mr. Edry, shared his story via a TEDx speech, which has now been viewed more than a million times. However, they hate the fact that Iranians control it. So glad to see this kind of story. Living in Asia for two years now, I see just how governments are the ones causing problems. A lot of preconceived notions I had are being obliterated. When everyday people get together from different cultures, we realize we all just want the same thing. I’m ashamed for my ways of thinking before I came here.